The earliest painting on view in Wolf Kahn: Six Decades is a large landscape-derived abstraction from 1960 titled “Into a Clearing.” It features a loose, pulsing welter of brushstrokes that coalesce into lush zones of breathing, blooming color. “Weaving Gray and Yellow,” another oil on canvas completed fifty-four years later, and also on display in “Six Decades” shows a similar gestural approach but with added notes of linearity and a little less painterly vapor. Consistently in love with landscape — and the idea of landscape as an abstraction — Wolf Kahn has lovingly built a very vivid and beautiful oeuvre since first exhibiting his paintings at the Hansa Gallery, one of New York’s first co-op galleries, nearly sixty years ago. The artist has but one idea,” noted Henri Matisse. “He is born with it and spends a lifetime developing it and making it breathe.” Wolf Kahn, whose ability to manage and juxtapose fields of radiant color suggests a kinship to Matisse, has indeed built his career around a certain singularity of vision. Kahn’s singular idea, which is hard to put into words, seems to revolve around the idea of making color dance. 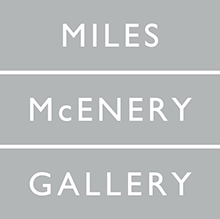 Although he has been connected through friendship with other great colorists – including Milton Avery and his teacher/mentor Hans Hofmann – Kahn has a challenging and personal sense of what he wants color to do: so much so that the Robert Gamblin Company has developed a set of eight “radiant” high intensity tints that meet his needs for color hues that reflect the maximum amount of light. Through the years ribbons of color have woven themselves into the fabric of Kahn’s distinctive and enticing world. Over time, Kahn has asked color to do everything it can do it possibly can: except to stand still. I recently spoke to Wolf Kahn on the phone to ask him about his past, his use of color, and the development of his work over time. John Seed: Can we talk a bit about your past? Wolf Kahn: As long as we don’t dwell on the past: I bring a bit of a load with me. It is the present that is the most interesting, really. You could mention that I did grow up with and close to Willem de Kooning and Mark Rothko: I inherited them from my wife’s connections. You see, I married a painter — Emily Mason — who was the daughter of a painter: Alice Trumbull Mason. Alice was in close contact with the first generation of the Abstract Expressionists and was herself a geometric abstractionist: she was a friend of Mondrian’s. My wife grew up in a culture of painting and her best friend was Milton Avery’s daughter March. JS: But while you knew many outstanding abstract painters you have been a representational painter throughout your career. WK: I’m surprised that Diebenkorn said it like that. He certainly came from a much more representational background than his later paintings would indicate. JS: You are known as a colorist. Who influenced your sense of color? I know that you were very friendly, for example, with Milton Avery. WK: No, I wasn’t influenced by his color. The only people who ever influenced me were Titian and Rembrandt. Of course, Hans Hofmann was my primary teacher for two years and then I worked for him as a studio assistant. JS: And you must have communicated very well, since you both spoke German. WK: He (Hans Hofmann) used to say, “My French is terrible, my English can hardly be understood and my German I have forgotten.” He was a brilliant guy. JS: By any chance did you know my mentor Nathan Oliveira? WK: Yes: Nathan was a good friend of mine too. In my book there is photo of Nate and me walking along having a discussion. Have you seen the book? It came out in 1996 — followed by a second edition in 2011 — and it was written by Justin Spring and has essays by Karen Wilkin and Louis Finkelstein. JS: I need to get a copy of that. What is happening in your painting right now? WK: People say I am doing my best work right now: it isn’t as precise as it used to be. One of the things I like to do these days is to be less descriptive. Doesn’t mean being more abstract: it just means being less precise. JS: So if you are worrying less about making things less identifiable, how does that affect you? WK: It makes me free up my arm. You don’t have the feeling that when you are painting a branch you don’t have to describe the branch. If you are a figurative painter and you want to put in a third leg you’d have to be Michelangelo to get away with it. So, being less precise allows me to be compositionally and formally more inventive. JS: Are you working indoors or outdoors or both? WK: I’m in the studio most of the time, but I go out with a friend Raymond Rusekas: he is a very good pastel artist. We just take our moveable studios — pastels in a bag and drawing pads — in the car and then we strike out and look for good subject matter, which can be anything. WK: My color right now is being reduced to mostly black and white and yellow. Every now and then I add another color that is formally required. It’s not that I am that interested in expressing the possibilities of color right now: I’m more interested in texture and density. JS: Do you have some favorite brands of artist’s materials? Are there any special pigments that you favor? WK: My favorites are the handmade pastels by Diane Townsend, and I also like a new line of soft pastels made by Terry Ludwig who is in Colorado. In paint I like Winsor Newton: everybody likes Winsor Newton. I also like Gamblin: Robert Gamblin is a friend of mine. He developed some colors on the bais of my advice: “Radiants” which are eight high intensity colors mixed with white. Robert is very interested in expanding the possibilities of color. He has a wonderful violet called Dioxazine Purple: it is so dense you can use it as a black. JS: Who are some other artists that you admire? WK: Lennart Anderson is a very fine painter: I collect him. Susan Rothenberg: I like her painting. I also like Sandra Mendelsohn Rubin, who you recently wrote about. JS: How did it feel to attend the opening of your show — Wolf Kahn: Six Decades — at Ameringer McEnery Yohe? WK: Well, I’m 86 and it could be my 86th show — so it’s not anything that I am going to get wildly excited about — but there are always people who show up that you don’t expect. Lately, I have been selling paintings to politicians. WK: Well, Bill Clinton, Mayor Bloomberg, and strangely enough, Henry Kissinger. I don’t know why he would like my work but he seems to: I’m a liberal Democrat. I hope I have given you enough for a good interview. WK: I sort of am, but wise is over-stating the case. 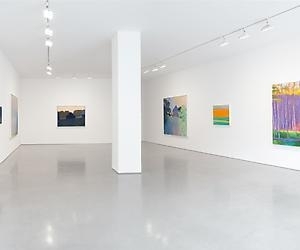 Wolf Kahn: Six Decades continues at Ameringer McEnery Yohe (525 W 22nd Street, Chelsea, Manhattan) through May 31.